Are Fancy Public Spaces Worth the Money? Yes, these designs and public spaces are beautiful and interesting design-wise, but are they worth the money to construct? Is it worth the money at Union Square in San Francisco to use stone paving instead of concrete? Is it worth the money to incorporate custom designed elements into a park or public space that cost much more because of their unique or custom nature? Would the public be better served by spreading tax dollars or other park funding sources thinner over a wider area? Should there be better funding of future maintenance of parks, rather than spending all the money on a fancy new installation that weathers poorly? If the choice is to install ten nice small parks in a city, or one avant gard fancy park, which benefits the community more? A lot of the answers to these questions are wrapped up in machinations of politics, the way public works projects (or semi- public projects) are funded, the type of projects designers want to design (award winning and new), and our general public curiosity with new and interesting designs. All this does not mean that it is the best use financially, that this money provides us the most benefit publicly for the money invested. Public projects might benefit if these questions were examined upon funding of new park or public works project. And yet, these questions are asked, and design projects are heavily value-engineered to strip out expensive elements and keep down costs. In the end, the goal should be, which park is going to be serve the public and benefit the community. A subjective and difficult question to answer- if this is the central question or focus, does a landmark the Golden Gate Bridge get built? 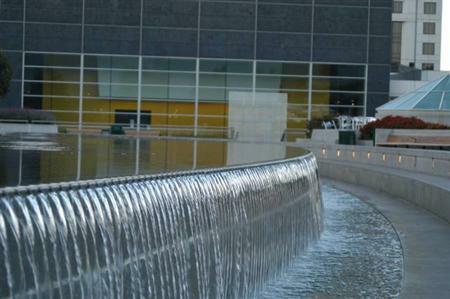 Are features, like this fountain in San Francisco’s Yerba Buena Park, worth the high cost of installation and maintenance for the enhancements they provide to the park space?